The 1000 series grades of aluminium are the purest of all of the commercial aluminium grades. Each and every grade in the 1000 series contains a minimum of 99% pure aluminium. This high aluminium content gives the 1000 series grades exceptional resistance to corrosion caused by both chemicals and the atmosphere. Grade 1050 is the most common grade of aluminium sheet available in the UK. Grade 1050 aluminium has the lowest strength of all commercial grades of aluminium. It is most commonly available in H14 temper, which is classed as half hard. 1050H14 is an extremely ductile grade of aluminium, and therefore it is most commonly used by fabricators and sheet metal workers who will bend and form the sheet into a requested shape. 1050H14 also has a highly reflective surface and therefore is also often used in the lighting industry for reflectors. All of our 1050H14 Aluminium sheet comes with a peel-off PVC coating on one side of the sheet to prevent surface scratching during cutting, processing and delivery. Grade 1050 is exclusively a sheet specification, and other items such as sections and bars will not be found in this grade. Grade 1050H14 aluminium sheet contains a minimum of 99.5%pure aluminium and therefore has excellent corrosion resistance. It has great resistance to chemicals and can be used outside without rusting. It is suitable for use in saltwater, however grade 5251 will perform better in this environment. 1050 H14 aluminium sheet is excellent for welding, brazing & soldering. Due to its very high aluminium content (99.5% minimum), grade 1050 H14 aluminium is quite soft and therefore it is not really suited to various types of machining as tools and cutters will quickly clog up. Grade 1050 H14 is however suitable for laser cutting. Grade 1050 H14 aluminium sheet is designed for cold working & forming. It is extremely ductile, and is a truly bendable grade of aluminium. You can take a sheet of Grade 1050 H14 aluminium and fold it over, back on itself and it does not crack or break. 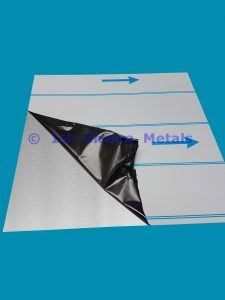 Should you require your grade 1050 aluminium sheet folded, then please contact us for a quotation. Grade 1050H14 Aluminium sheets are suitable for Protective, Colour, Bright and Hard Anodising. Grade 1050 H14 Aluminium sheets are suitable for polishing. Grade 1050 H14 Aluminium sheets are suitable for powder coating.